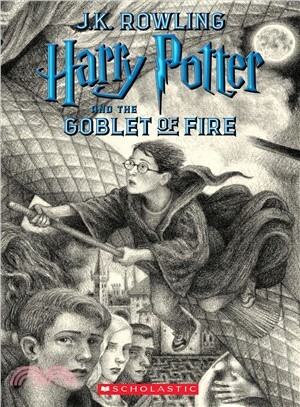 "Harry Potter and the Goblet of Fire is the pivotal fourth novel in the seven-part tale of Harry Potter's training as a wizard and his coming of age. Harry wants to get away from the pernicious Dursleys and go to the International Quidditch Cup with Hermione, Ron, and the Weasleys. He wants to dream about Cho Chang, his crush (and maybe do more than dream). He wants to find out about the mysterious event involving two other rival schools of magic, and a competition that hasn't happened for a hundred years. He wants to be a normal, fourteen-year-old wizard. Unfortunately for Harry Potter, he's not normal - even by wizarding standards. This gorgeous new edition in celebration of the 20th anniversary of the publication of Harry Potter and the Sorcerer's Stone features a newly designed cover illustrated by Caldecott Medalist Brian Selznick, as well as the beloved original interior decorations by Mary GrandPré. J.K. Rowling is the author of the record-breaking, multi-award-winning Harry Potter novels. Loved by fans around the world, the series has sold over 450 million copies, been translated into 80 languages, and made into eight blockbuster films. She has written three companion volumes in aid of charity: Quidditch Through the Ages and Fantastic Beasts and Where to Find Them (in aid of Comic Relief and Lumos), and The Tales of Beedle the Bard (in aid of Lumos), as well as a screenplay inspired by Fantastic Beasts and Where to Find Them, which marked the start of a five-film series to be written by the author. She has also collaborated on a stage play, Harry Potter and the Cursed Child Parts One and Two, which opened in London’s West End in the summer of 2016. In 2012 J.K. Rowling’s digital company Pottermore was launched, where fans can enjoy news, features, and articles, as well as original content from J.K. Rowling. J.K. Rowling is also the author of The Casual Vacancy, a novel for adult readers, and the Strike crime series, written under the pseudonym Robert Galbraith. She has received many awards and honors, including an OBE and Companion of Honour, France’s Legion d’honneur, and the Hans Christian Andersen Award. Brian Selznick’s books have garnered countless accolades worldwide, and have been translated into more than 35 languages. He is the Caldecott Medal-winning creator of the #1 New York Times bestsellers The Invention of Hugo Cabret, adapted into Martin Scorsese’s Oscar-winning movie Hugo; and Wonderstruck, adapted by celebrated filmmaker Todd Haynes, with a screenplay by Selznick; as well as The Marvels and Baby Monkey, Private Eye (co-written with Dr. David Serlin). Selznick divides his time between Brooklyn, New York, and San Diego, California. Mary GrandPre has illustrated more than twenty beautiful books, including The Noisy Paint Box by Barb Rosenstock, which received a Caldecott Honor; Cleonardo, the Little Inventor, of which she is also the author; and the original American editions of all seven Harry Potter novels. Her work has also appeared in the New Yorker, the Atlantic Monthly, and the Wall Street Journal, and her paintings and pastels have been shown in galleries across the United States. Ms. GrandPre lives in Sarasota, Florida, with her family.